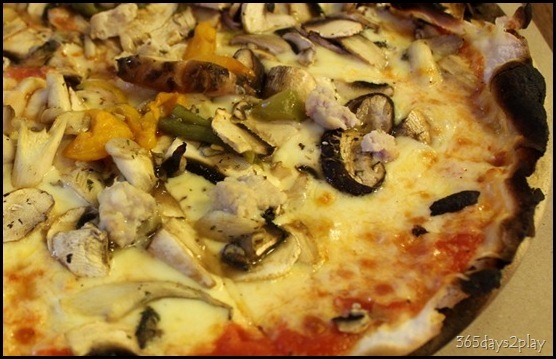 Lately I’ve been into pizzas after knowing about a friend’s interest in opening a pizza joint. 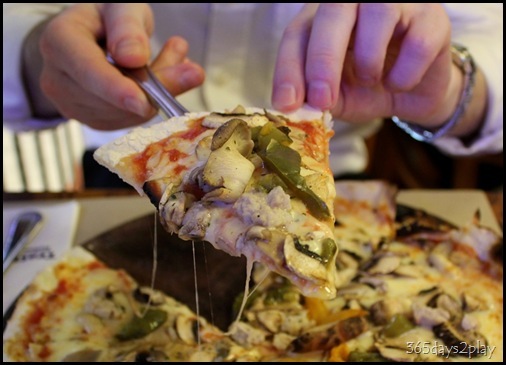 I am definitely no expert in pizzas, but I think that many Singaporeans are mistaken when they think they like thin and crispy pizzas as compared to thick bready based pizzas. Thick, bready based pizzas are definitely a no-no, and we all know which American chain introduced us those sub-standard pizzas. But thin and crispy pizzas are not the way to go either. I tried Skinny Pizza once and regretted the experience. It’s so crispy, it’s like eating crackers with toppings rather than pizza. I am told that making the correct Italian style pizza base requires not only skill, but a really hot wood fired oven. Get the equation wrong, and you end up with everything but the real thing. Apparently the real base still tastes doughy and is moist. When you’ve tried that, you won’t ever turn back again. IeatIshootIpost has done a really good description of what an Italian styled pizza should be like. As for me, as I said, I’m no expert so I’ll just focus on reporting about the possibly good pizzas I’ve tried lately. One of them comes from Trattoria Cucina Italiana, also known as Trattoria Italian Kitchen located conveniently at 313@ Somerset. 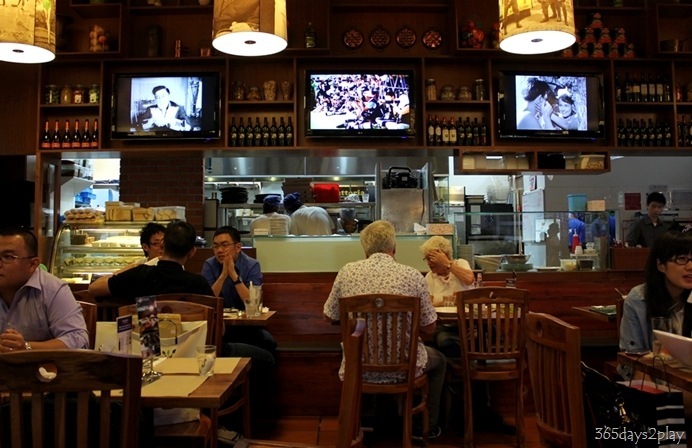 First opened in Bali, Indonesia in 2002 by 2 Italians Edoardo Guerrini and Olivari Vanni, Trattoria Cicina Italiana restaurants can also be found in Jakarta, Medan, KL and Singapore. I thought the taste was very good. It had a rich tomato sauce base with liberal amounts mozzarella oozing all over the place. The base was still moist and slightly floppy. Huge portion for just over $20 bucks! Squid Ink pasta with salmon. I have to admit the presentation was a little shocking. Looked like a plate of fat black worms. 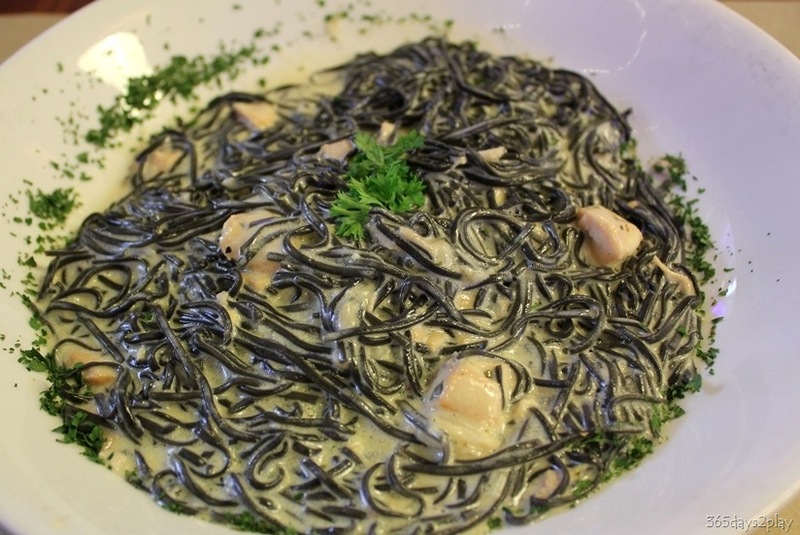 Maybe black pasta should not be tube shaped…tagliatelle would be a better choice, but then again, that might remind you of flatworms…. anyway…this dish was also quite nice. I felt it was a little lacking in ingredients, salmon is the only solid ingredient in there. However, the pasta was very tasty on its own and made tastier with the creamy sauce. 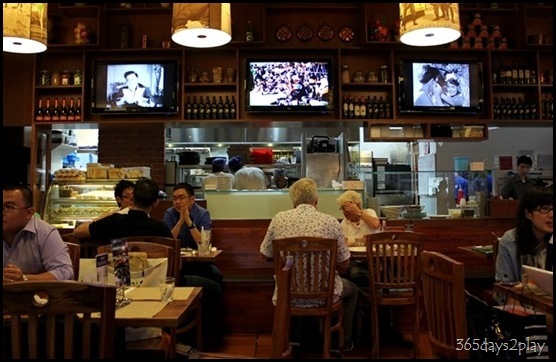 Nice place with TVs to entertain you if your dining companion is busy with Facebook on the iPhone. Or you could people-watch the crowd rushing out of the Somerset MRT station. However the chairs are pretty hard and it’s just not comfortable enough to want to linger any longer than necessary. the pizza looks really thin! Where did you eat this? oohh….looks good! where did you have this? Actually it’s not too bad. The last few times I had squid ink pasta, they always were tagliatelle and they looked presentable. Twirled neatly and piled up high. This one was a little messy.